I hope that you can help me with the following. I have recently been in hospital and diagnosed with gallstones. I have been told that I will need to have my gallbladder removed in the near future. How long should I leave it after having it removed before I go back to diving? Also, can I continue to dive before it is removed? Many thanks for your assistance in this as my consultant doesn't have any answers with respect to diving. I wonder how many people are wandering about with gallstones without knowing it... About 1 in 3 women, and 1 in 6 men, form gallstones at some stage in their life. Most people don't know they have them because they generally sit in the gallbladder doing nothing, except possibly growing bigger. In this situation they can be safely left well alone. In 3 out of 10people, however, they cause symptoms, which may be colicky type abdominal pain or rarely jaundice. In even fewer people the gallbladder gets infected and this causes severe pain, often with fevers and vomiting - this usually results in hospital treatment and getting the gallbladder removed early. There is no harm in diving if the stones don't cause you symptoms, but if you get colicky pains underwater there is a high chance of dropping your reg or panicking with potentially dire consequences. 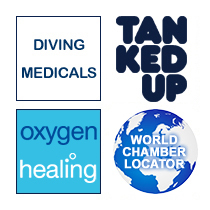 Diving after the surgery depends on how long the wound takes to heal up - I would suggest a minimum of 6 weeks to allow the stitches to heal up. I am about to go into hospital for an operation to remove my gallbladder, ( I am on an emergency list and have been since October, it should be done by the end of February, emergency!). After the operation, how long will I not be able to dive for, I have heard approx 6 months, I am about to start booking dive trips starting from April. “Came in for her gallbladder, took out her thyroid.” Cue raucous laughter from 1950’s surgeons. True story, I heard it from them. Thank the Lord for Med-Neg lawyers, or then again maybe not. Big cut through your abdomen, give it 3-4 months ballpark. Through the keyhole - where Loyd Grossman does it - only 2 months max, as he’s quite handy with a knife.